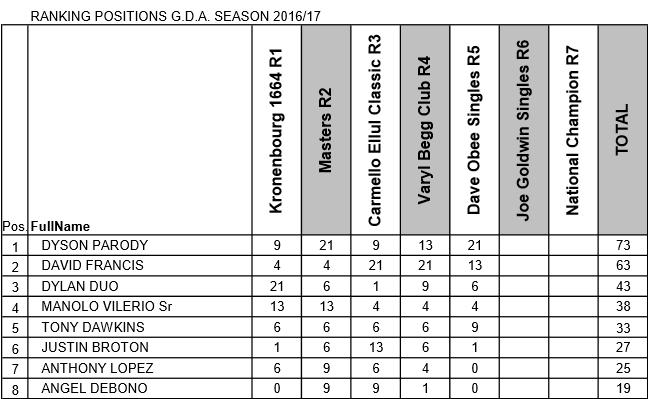 Last Friday saw the GDA’s 5th Ranking Tournament of the season, the Dave Obee Singles, with a great participation of 49 players. This seeded tournament is named after the Late Dave Obee who together with Carmelo Ellul founded the GDA back in 1958. The four seeded players had mixed success on the night, with Justin Broton narrowly losing his 1st round match to Alex Nuñez 3-2 & Manolo Vilerio losing in the 2nd round to Dylan Duo 3-1. George Federico managed to reach the Quarter Final which he lost to Youth player Craig Galliano 4-1. Dyson Parody was on fine form all night, losing only 2 legs on his route to the final. In the Semi-finals David Francis kept up his recent excellent form beating a determined Craig Galliano 5-2. 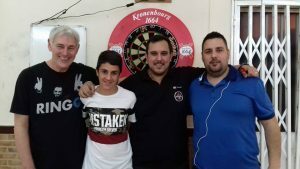 It’s great to see a Youth Academy Player doing so well and it shows that the future of darts in Gibraltar is assured. The other semi-final saw Dyson Parody take on Tony Dawkins who was unable to trouble Dyson too much losing 5-1. The first leg was a close match, both players scoring strongly. Dyson had left himself 60 with David on 135, which he promptly checked out on the Bull. The 2nd leg was dominated by David who threw 4 consecutive 100’s before checking out on Double 10. Dyson threw a maximum 180 in this leg but did not get to throw at a double. From then on however Dyson powered ahead claiming leg after leg. Each leg was fiercely contested as David was not far behind, but David was unable to claim any further legs. Dyson threw another 180 in the 5th leg, and finally checked out a Double 16 to claim victory in the 8th leg. Final Score Dyson Parody 6-2 David Francis. A total of 14 x 180’s were thrown and 3 x 100+ finishes recorded. 180’s – Dyson Parody x 4, Dylan Duo x 3, George Federico x 2, Jarvis Bautista, George Ramos, Jerome Duarte, Jadrian Pecino, Carlos Muñoz x 1. Commiserations to David Francis, Congratulations to Dyson Parody!